As you know, we BA3 students have the opportunity to spend the first semester abroad. 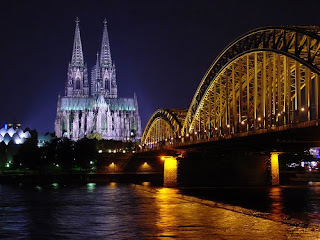 I had the enormous chance to go to Cologne (North Rhine-Westphalia) in Germany in order to improve my German. Cologne is the fourth largest city of Germany (after Berlin, Hamburg and Munich) and has about one million inhabitants. And, as you can easily imagine, there is always plenty to do: Cologne is a very rich city culturally speaking. There are over 30 museums including the Romano-Germanic museum, the Ludwig museum and the chocolate museum (probably the most interesting one!). There are also many monuments to visit. For instance, the Cathedral (Kölner Dom) which is the biggest gothic church in North Europe and which shelters the shrine of the three Holy Kings. Cologne is also known worldwide for the Christmas market at Cologne Cathedral and the Carnival. Firstly, the Christmas market was elected the most beautiful one among Europe and millions of visitors are present for this occasion every year. Secondly, there are hundreds of thousands people at Cologne Carnival from Thursday (Weiberfastnacht, the Women's Carnival) to Ash Wednesday. The carnival season officially starts on the 11th of November at 11:11 am and lasts until Ash Wednesday. Of course, there are also a lot of movie theaters, bars, pubs and clubs! In short, it is impossible to get bored in this town! As far as the university is concerned, it is a bit hard at the beginning because we have to fill in many papers and the German system is completely different from ours. Indeed, we have to choose our classes and ask the professors by mail if we can attend the course. There are not enough places for everyone in the seminars and German students had already booked their place during the summer so it was a bit difficult in the first week to find courses. But everything went alright in the end. But for those of you who will go to Cologne next year, do not hesitate to go to the first sessions, professors may not refuse any Erasmus students (of course, they only told me this afterwards). Just so you know, there are no first or second years in Germany, there are semesters. That is to say that you do not say "I am in my third year" but "I am in my fifth (or sixth) semester". Obviously, it takes some time to adjust as the system is different (but it is really quick). For example, there are no course notes. Do not panic, we do need any most of the time (German students take notes very rarely). And if course notes are actually needed, you have to go to the seminar library and copy them. It is also useful to know that, instead of clapping their hands at the end of every class or of a presentation, they "knock" on the table so to speak. I was really surprised at my first lesson. As for the exams, there are no "blocus" time but, once again, it is not necessary. It depends on the courses you choose of course, but we are rarely expected to know everything by heart as in Belgium. What is more, we can often choose if we want to take an exam (oral or written), to do a presentation or a to write a paper. It all depends on how many Credit Points we need. As to the accomodation, I was very lucky to find end of June a room in a private appartment. As a matter of fact, I found it in this website. The room belonged to an Erasmus German girl who had to go to Paris for the same period as me in Cologne, so she sublet her room to me. The appartment was really perfect, it was fully equipped and its situation was really great. I was in the city center, two minutes away from the metro station and only 15 minutes away from the university (both by foot). The only downside was that my two roommates were not really kind and we did not get along very well. Concerning my German skills, I understand much better than before but I have to admit that I did not make much progress in speaking. Four months are not enough at all to really improve. Besides, I met a lot French-speaking people so I did not speak German enough. We could not help speaking French, it was really weird to speak German between us. To conclude, I would like to say that this experience was just amazing! I will never forget the wonderful moments I spent there and the wonderful people I came to know. I know it can seem a bit scary at first because you are alone in a new town where you do not know a soul. You have to speak another language and to manage everything by yourself. But it is amazing how quick you get used to all of this and how quick you make friends. Furthermore, you have so many things to do at the beginning that you have no time to think of this. And there are so many other foreign students in the very same situation as yours. It is clearly impossible not to get to know anybody. I just have one thing more to say: Erasmus is a fantastic experience, do not hesitate to do it, you will not regret it! I'm a belgian student and would like to get some practical information about your erasmus trip in Colonge. I am interested on these place so much and if you easily imagine there is always plenty to do. Anyway thank you so much for bringing up this.